Nutrient Database for Standard Reference". This database contains detailed information on over 10,000 food items. Nutrition Complete is a useful patient education resource, particularly when discussing or developing an appropriate diet with a patient. 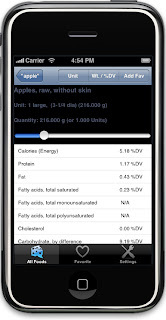 Nutrition Complete costs $4.99 and is available from the iTunes AppStore.